Windham, R. (2008). Indiana Jones and the raiders of the lost ark. New York, NY: Scholastic. For those who love all things Indiana Jones. 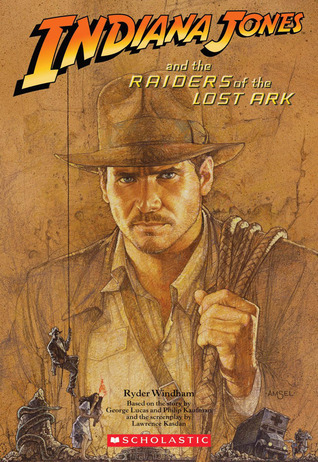 Indiana Jones and the Raiders of the Lost Ark novelization by Ryder Windham is based on the story by George Lucas and Menno Meyjes and the screenplay by Jeffrey Boam. Taking place in 1936, a professor of archeology from Marshall University in Connecticut is led through a series of events to the famed Lost Ark of the Covenant. The book begins with Indiana Jones in the jungles of Peru, searching for a gold idol. He does find the idol, but loses it to a rival of his, Rene Belloq, a “mercenary archaeologist” who contracted his services to those that had private collections. Once back from Peru, Jones meets with an old friend and colleague, Marcus Brody, who introduces Jones to two gentleman that tell Jones about a communication intercepted from the Nazis in Cairo, Egypt, where they claimed to have found the city of Tanis, the hidden city where the Lost Ark of the Covenant that carried the actual Ten Commandments in. This Ark was once kept in the Temple of Solomon in Jerusalem, but an Egyptian pharaoh took the Ark and hid it in the city of Tanis, where it has been lost ever since. Army Intelligence wants Indiana Jones to find the Ark and keep it from getting in the hands of the Nazis, for it is said the Ark has immense power for those that have it. Jones’ search starts by going to Nepal, in search of the Staff of Ra, which is said to have instructions on how to find the actual location of the Ark. There he finds Marion Ravenwood, his former love and daughter of the man Jones suspected as being the last person who has possession of the headpiece to the Staff of Ra, the key to finding the location of the Ark. After narrowly escaping from Nazis who, led by Albert Toht, followed Jones to Nepal to acquire the headpiece themselves, Jones and Ravenwood travel to Cario, where they have many attempts on their lives. There, with the assistance of Jones’ friend, Sallah, they discover where the tomb of the Ark is, and yet are foiled again by the Nazis, when their rescue work is discovered. Ultimately, the Ark is opened, and the forces within destroy the evil Nazis and Jones and Ravenwood are saved by not looking at the Ark when open. The Ark is then transported to the US, where it is taken to a warehouse; the Ark’s crate has “Top Secret – Army Intel” stamped on it and is stored with hundreds of other crates just like it. Main characters include Indiana Jones, Marion Ravenwood, Sallah, Rene Belloq, Arnold Toht, and Marcus Brody. Indiana Jones, the protagonist, is a dashing adventurer but also an esteemed professor of Archeology at Marshall University in Connecticut. He is the good of the story, against the evil of the world. His trademarks are a worn fedora, a beaten leather jacket, and a coiled bullwhip that he always has with him. Marion Ravenwood, the accomplice of Jones; is the holder of the headpiece of the Staff or Ra. Marion is a former love of Jones; her involvement starts as a piece of the puzzle but ends with her and Jones getting back together. She is a strong and brave woman, but has a soft side for Jones. Sallah is the friend that is always there for Jones when needed. He helps in Cairo, guides Jones to where the Nazis are digging for the Ark, and assists him in removing the Ark from the city of Tanis. Rene Belloq is introduced early as a competitor of Jones for archaeological finds, such as in Peru, Belloq becomes an agent of the Nazis, assisting them in the search for the Ark. He has a soft spot for Ravenwood, which inevitably becomes part of his demise. Arnold Toht, a Nazi agent and spy, almost killed Jones and Ravenwook in Nepal, and then found them again in Cairo. He’s the representation of Nazi evil, with long, black leather trench coat, the stereotypical look of a Nazi agent. And, Marcus Brody, an archeologist friend of Jones brought Indiana into the search for the Lost Ark. This book is a novelization of the actual film, Indiana Jones and the Raiders of the Lost Ark. The storyline follows the film; in most book-to-movie translations, the movie is taken after the book. However, in this case, the book is taken from the movie, so it is clear that it follows the film precisely. Within the book, there are several full-color and full page photos from the movie from the gigantic boulder chasing Jones out of the cave in Peru, to being with Marion in her bar in Nepal, to various disguises that Jones used during the adventure, and well as some more well-known actions scenes in the film that fans of the film will enjoy or may entice young readers to who have yet to see the film to want to. This is the first in the Indiana Jones novelization trilogy by Windham and Scholastic (edition is only available for distribution through the school Scholastic book fairs) with a photo of Indiana Jones, portrayed by Harrison Ford, ready to take the idol from its resting place in Peru. Indiana Jones and the Raiders of the Lost Ark novelization will appeal to any fan of the Indiana Jones films, those who love action-adventure, archeology, historical fiction, and treasure. This novel is a direct copy of the film but just as enjoyable to read. Ryder Windham has written other novelizations for the Indiana Jones films as well as Star Wars including DK Publishing’s Star Wars: The Ultimate Visual Guide (updated and revised – 2012) and Star Wars: The Year by Year: A Visual Chronicle (2010).